Mt Vernon Wicked History Pub Tour: Duration 2 hours $22/pp, 21 and over only. Join us in Baltimore’s Mt Vernon neighborhood for a journey into the scandalous history of some of the most esteemed members of Baltimore society. From the Gilded Age to the Jazz Age, Mt Vernon Baltimore has it all. It was here that Francis Scott Key died, and his second cousin, F Scott Fitzgerald drank himself nearly to death. Here Mary Garrett Jacobs ruled Baltimore society, Zelda Fitzgerald’s disastrous play was staged, and Wallace Warfield Simpson first worked her wiles. Mt Vernon has hosted kings and presidents, and not a few famous writers. Join us to revisit the intrigue of the past along these hallowed streets. Tour departure point: All Mt Vernon Haunted Pub Tours depart from the Marquis De Lafayette Statue in Mt Vernon park- near Baltimore’s Washington Monument on Charles St. This is conveniently located just adjacent to the Charm City Circulator Purple Route stop 307 in Mt Vernon. 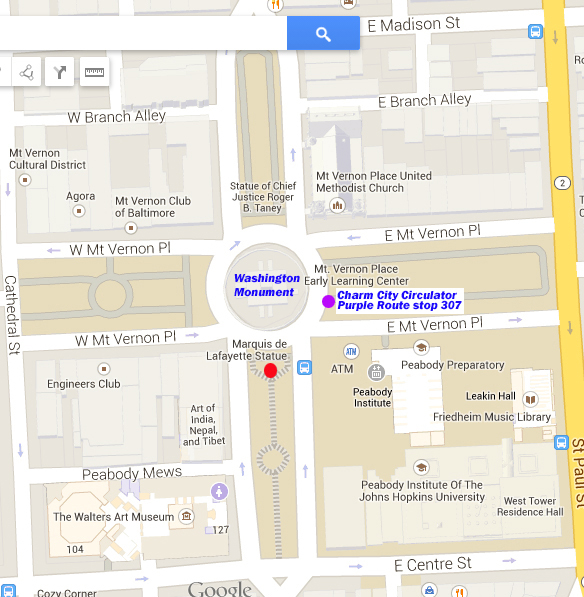 A map showing the exact location is here.